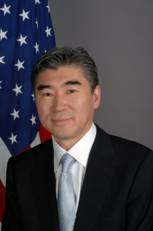 Sung Kim, a career member of the Senior Foreign Service, class of Counselor, became the Special Envoy for the Six-Party Talks in July 2008 and was accorded the rank of Ambassador following confirmation by the United States Senate. Previously, Sung headed the Office of Korean Affairs. He has also served in Seoul, Tokyo, Kuala Lumpur and Hong Kong, and the Office of Chinese Affairs in Washington. Prior to joining the Foreign Service, Sung worked as a prosecutor in the Los Angeles County District Attorney's Office.